Shannon is a graphic designer and illustrator and resides in Ocean Grove, Victoria. Shannon graduated with a Bachelor of Graphic Design and Multimedia from Federation University Australia in 2015. Shannon’s raw and diverse creativity has since flourished. She coordinates the design and layout of quarterly publication, Ballarat Lifestyle Magazine, which is distributed throughout Ballarat and Central Highlands. 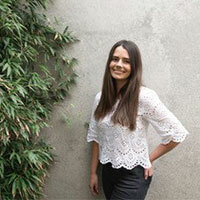 She is also event manager of the Ballarat Lifestyle Magazine Book Club. Shannon rebranded and coordinated the design and layout of the quarterly, Junkies Magazine, which has an international distribution. She previously worked for ROAR Strategy & Design as a graphic designer, illustrator, and social media manager. Shannon currently works full-time for Rip Curl as a graphic designer at its Torquay headquarters. She enjoys exploring design markets, and spending time by the beach as often as possible. Future aims include a solo art exhibition, delving more into animation, exploring packaging design, and working in the fashion industry to design high-end publications. Read more on her personal website, her online portfolio, or on the Ballarat Lifestyle Magazine website.